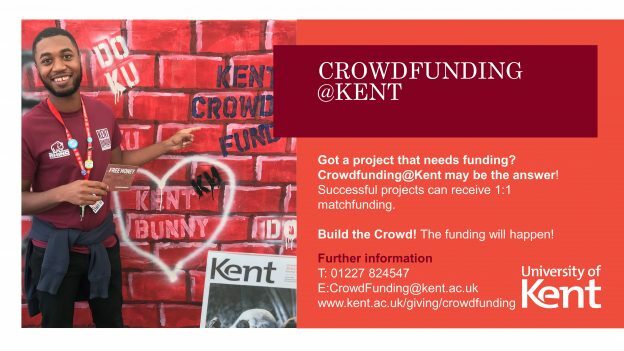 Crowdfunding@Kent – Build the crowd! A joint project between Kent Union and The Development Office, Crowdfunding@Kent provides a vehicle for small student projects to be funded throughout the year. The best projects could even receive match-funding up to £1000. Students, groups and societies are invited to apply online. The most exciting and best supported projects will be first in the queue to try their hand at crowdfunding. A test project run through the platform earlier this year called The Green Room – From Tree to Building successfully raised more than £6,000 to construct a teaching and social space using timbers cut from campus woodlands. For further information email crowdfunding@kent.ac.uk or download an application form. This entry was posted in Campus online, Student Guide and tagged Campus online, Canterbury, Medway, Student Guide on 28 September 2018 by Michelle Ulyatt. InnovateIT – What’s your idea?